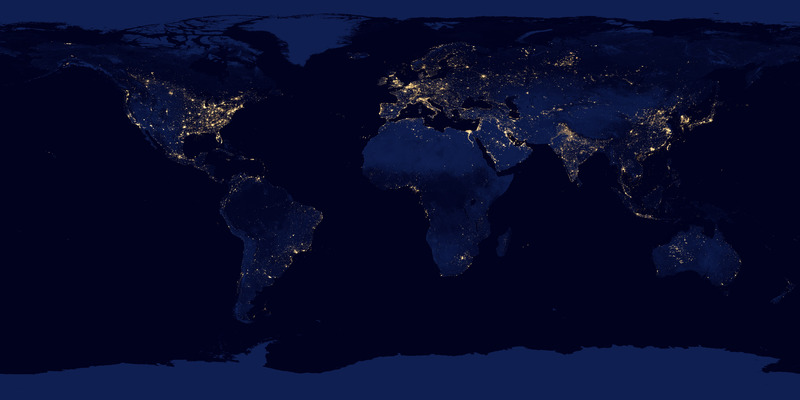 NASA has unveiled the most detailed nocturnal image of Earth to date, and it's a stunner. Hey, Dave Stanley in San Diego – you left your lights on again. Well, okay, this stunning shot of Earth's cities glowing at night isn't that detailed. But it's close: The device used to image the planet, the Visible Infrared Imaging Radiometer Suite aboard the satellite Suomi NPP, is eagle-eyed enough to pick out ship beacons shining from the gloom of the Yellow Sea. Suomi also can detect dim signals issuing from street lights, Australian forest fires, gas flares in the Middle East, the Aurora Borealis and perhaps even these illuminated parkour enthusiasts – the work it has done here makes this the most comprehensive nighttime picture of the planet in existence. Scientists from NASA showed off the composite global image on Wednesday at a American Geophysical Union meeting in San Francisco. It was stitched together from shots that Suomi that captured on cloudless night in April and October, a mission that only took 312 orbits to complete. Some folks are calling the map of light the "Black Marble" to signal the arrival of a suitable nocturnal twin to the "Blue Marble," NASA's ever-evolving image of our planet's globular entirety. Why's this a big deal? Aside from discerning which cities are total energy hogs, the ability to see Earth at night will help fine-tune the accuracy of weather forecasts. "With its night view, VIIRS is able to detect a more complete view of storms and other weather conditions, such as fog, that are difficult to discern with infrared, or thermal, sensors," explains NASA. "Night is also when many types of clouds begin to form." Images courtesy of NASA and NOAA.